Sorry I haven’t posted in a few days but I have run into some of the worst internet connections I have had in all my trips. So, now that this trip is all but over, Let me catch you up on where I’ve been and what I’ve been eating. On Wednesday I spent the entire day driving out of South Carolina. I couldn’t find any interesting places to stop. I couldn’t even find any uninteresting places to stop. 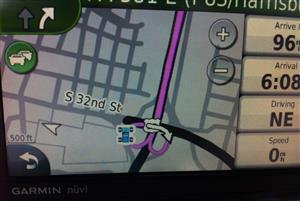 It was all just driving the Interstates. It was a long boring day and I was getting beat. At one point I was so tiered I stopped at a gas station and took a 30 min nap in the parking lot. That refreshed me enough to get across the border into Tennessee where I stopped for the night. The only fun part was the last 10 miles was all downhill through some winding Interstate highway roads that had lots of switchback turns; I just wish I was awake for all of it. Thursday was a much nicer day, the weather was beautiful, traffic was light and I was avoiding the Interstates. While driving through a small town in southern Tennessee I drove past the Tennessee Aviation Museum, so you know I turned around for that one. The museum is divided into two parts. First the museum and hall of fame where they display many of the artifacts they have collected over the years including uniforms, guns, tools and personal affects of some of the airmen. They also have a large display showing a piece of the structure from the USS Arizona. The other half is the hanger where they keep the planes. For a small museum they do have quite a collection of planes, many of them still flyable. 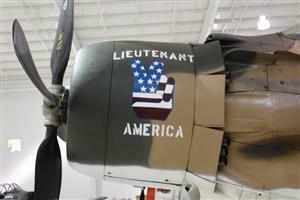 One of their centerpiece planes is Lieutenant America, a Douglas A-1H Skyraider that was rescued from Thailand a few days before the end of the Vietnam War. Then I was off to Nashville, the country music capitol of the world. 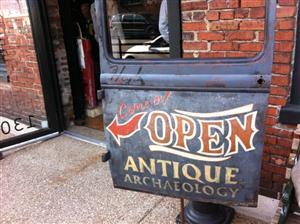 So I went to the new Antique Archaeology store. The “American Pickers” from History Channel. The store is very cool, everywhere you turn you see an item that they picked on the show, and the prices are not cheep. Although the store was packed, I think the only thing they really sell there are T-shirts, Hats and Posters. But I think they sell a lot of them. While I was there two of the guys that work at the store were trying to hang a large Hershey’s Ice Cream sign from the ceiling. Just as they thought they had it hooked they let go and asked the full store for a round of applause. That was when the sign started to fall and the second guy caught it. But it was still hanging by the end of a bolt. After about 15 minutes they got a second ladder and finally hung the sign properly and safely. 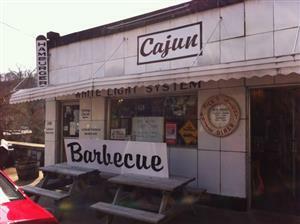 My plan was to have dinner at a Cajun restaurant in Nashville; unfortunately they closed an hour before I got to town. So I went for another DDD spot. 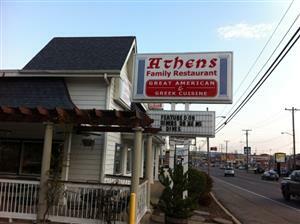 Athens Greek Family Restaurant. I of course went for the combo platter. The platter consisted of Suzukakia, Pastichio, and Dolmades. Which turned out to be a pasta dish, a meatball and a stuffed Grape leaf. It’s all Greek to me. For desert I had a piece of Baklava, which was nowhere near as good as the Baklava that Martha used to make. But overall, a nice restaurant, the food was good, but nothing exceptional. Friday I woke up and it was pouring rain. The first thing I had planed was outdoors just North of where I was. The weather report showed things were starting to clear to the North, so I needed to stall. Then I found the National Corvette Museum. 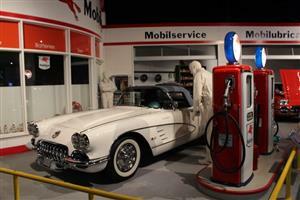 A museum dedicated to all things Corvette. In front of the building the parking spaces reserved for Corvettes are closer to the building than the Handicap spots. I was so tempted to park my rented Ford Fusion in one of those spots, but it’s their Museum, their rules… The Museum was fairly cool full of lots of Vets, Old, New, and everything in between. Overall, a great way to waste an hour and a half and $10. 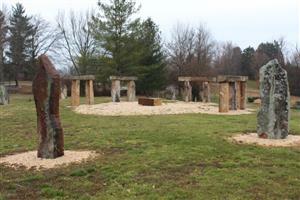 Then the skies opened up, The rain stopped and I arrived at the Kentucky Stonehenge. Seriously, did you think I would go on a trip and not find a Stonehenge replica. Although this henge is very well done it is a bit strange. It’s located in the side yard of a house, right next to the tennis courts. They even have a half circle attached to the driveway marked for Parking. Of all the henges that I have visited I would have to say this is not the best, but it is right up there near the top. Would you eat at this place, I did, and it was well worth it. Even if the food wasn’t good (it was very good), even if the prices were reasonable (they were very high), even if the place was packed (8 people would be considered packed), it would be worth a trip to Rick’s White Light Diner in Frankfort, KY. Rick is a one of a kind sort of guy, and it’s probably best that way. 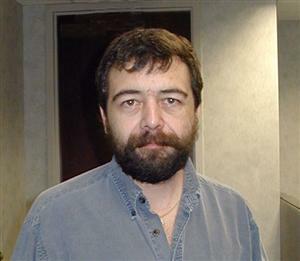 I’m sure he can be a bit of an ornery guy, but he’s also hilarious, and an excellent cook. The reason his prices are so high he will tell you is because he uses only the best ingredients. All of the seafood is from this country; the produce is local whenever possible, the beef is local and everything is organic. I of course went Cajun. I had Rick’s famous Crawfish pie, with garlic potatoes and a small pile of shredded lettuce smothered with a teaspoon of Thousand Island dressing. I accompanied this with a local beer, Kentucky ale. For desert I went with the Chess Pie. 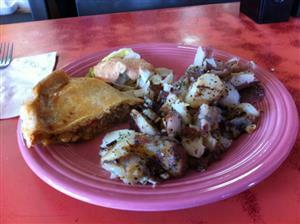 The crawfish pie was very good; it had just the right amount of heat for me. The potatoes were… potatoes, no big deal. The lettuce was confusing, I don’t understand why there was more dressing than lettuce. The chess pie was the best I’ve ever had. No, I’ve never had it before. It was still good though. From what I can find out it is just a basic southern pie. It’s flour, butter, sugar, and eggs all baked in a pie shell. Would I go back? Defiantly. The food is good, and Rick is whacked. Saturday I went to the U.S. Air Force Museum in Dayton Ohio. This is a Huge aviation museum. Larger than both of the Smithsonian Air and Space Museums combined. 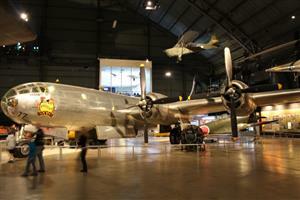 The museum consists of three huge hangers, each one could hold a B-52, a C-130 and a B-2, as well as 100 other planes. By the way, they do have all three of those planes here. 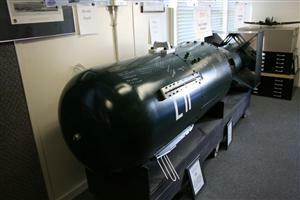 There is also a fourth room that is smaller, yet taller; this is where they keep the Titan missiles. When I was at the air and space museum in DC I saw the Enola Gay, the plane that dropped the first atomic bomb on Hiroshima, Japan. The plane shown here is Boxcar, Boxcar dropped the second atomic bomb on Nagasaki, Japan. I didn’t intend on seeing both planes on the same trip, it just worked out that way. Even though I’ve been to this Museum before, It is always worth a stop. Tomorrow, I’m driving home, back to work on Monday. See ya’ll soon. I wasn’t able to get a solid Internet connection last night, so I wasn’t able to post anything. I’ll start with a brief recap of Monday. I woke up in Falls Church, VA with about 2” of snow on the ground and more wet slushy stuff coming down. So rather than head into the storm and go to West Virginia and Kentucky I opted for warmth. I spent the day driving to Myrtle Beach, SC to one of my favorite restaurants, Nance’s Creekside. Back when my parents used to winter in Myrtle Beach they discovered Nance’s, it quickly became one of their favorite restaurants. When I visited my Dad the last 2 years he went to Myrtle Beach, He took me to Nance’s and it became one of my favorites too. 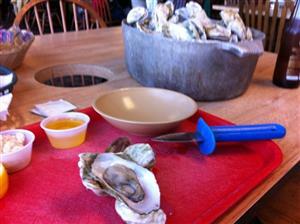 The specialty at Nance’s is the Oyster Roast. Locally harvested clusters of oysters steamed in large steel pots and ready for you to pry out of their shells. And when your done with the shells, just toss them through the hole in the table and into the trash can they place underneath. As always, the oysters were great and well worth the drive, not to mention it was 20 degrees warmer in Myrtle Beach. Tuesday I woke up, it was bright and sunny and warming up and because I hadn’t planned on coming this far south, and I had no internet, I had no clue where I was heading or what I was going to do today. So I decided to freestyle. First place I found was the Florence Art and History Museum, their claim to fame is the salvaged propellers from the CSS Pee Dee. 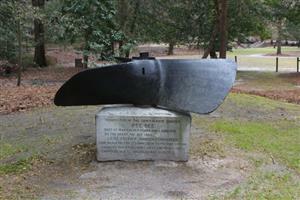 The Pee Dee was a confederate Ship built in the area and sunk by it’s own crew in 1865 before it could be captured. The propellers were recovered in 1925 and given to the museum. 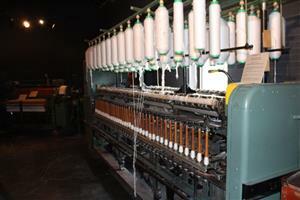 Next was the South Carolina Cotton Museum. Yup, a cotton Museum. I wouldn’t mind people “picking” on me about this if it wasn’t so “seedy”. Seriously, it was kind of cool. They had a lot of good displays that showed the process of taking cotton from seed to cloth. The Button Museum; you see what happens when I wing it, I end up in places like this. Honestly, I would have stopped here anyway. Dalton Stevens is the self proclaimed Button King. Many years ago Dalton started suffering from insomnia, so what do you do if you can’t sleep at night, you sew and glue buttons on things, all kinds of things, everything. The display in the Museum includes the three piece suit covered with buttons he wore on the Johnny Carson Show, his guitar, car, casket, hearse, Piano, toilet, tub and sink all covered with over a million buttons. The worst part is, he recently received a donation of over 300 pounds of buttons. As I was getting ready to leave the museum I was surprised by a visit from the Button King himself, this 83 year old man is still attaching buttons to things. And then there’s dinner. Tonight I went to yet another DDD Spot. The Farmer’s Shed, If you didn’t know there was a restaurant here you would never find it. I knew there was a restaurant here and I almost didn’t find it. When you pull up it looks like your typical farm stand. Outside are hundreds of colorful pots and planters stacked up for sale. Inside there are bins of fresh produce and planting supplies, some homemade pies, jellies, jams and such, and a little sign that says “restaurant in back”. All the way in the back is a door to a small 6 table restaurant that looks like they took the tables out of my grandmother’s kitchen, in fact I swear my grandmother had tables just like the ones pictured. 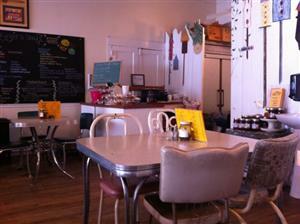 The menu of course is written on the large chalkboard wall with different selections for each day of the week. I told the waitress I was having trouble deciding between the country fried steak and the fried catfish. Three of the five customers in the restaurant turned to me and said “the catfish” I wasn’t going to argue with more than half of the restaurant, and they weren’t wrong. I’ve had catfish in Louisiana that wasn’t nearly this good. 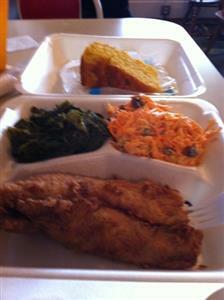 Along with the catfish I had collard greens, carrot and raisin salad, and a piece of cornbread. An awesome meal and well worth a trip to South Carolina. I was pretty wiped out when I went to sleep last night, Then around 1 AM something woke me up. I was fairly groggy but it seemed like the sound of a door slamming shut. I checked my door and realized I fell asleep without locking the deadbolt or putting on the chain. I looked out the peephole and saw nothing; my camera and laptop were still on the table next to the door. So I locked up the door and went back to bed. I figured it must have been the door next door slamming shut, no big deal. When I went to check out this morning I told the lady at the desk I was checking out of room 127. She asked why I was leaving after only one night; I only booked the room for one night; I have you listed for thee nights… When I told her my last name she said, oh you were in room 129; No, I was in room 127; I have you booked in room 129; I have a key for room 127, and that’s the room I slept in last night. Remember folks; ALWAYS lock the deadbolt and the chain of your hotel room. I don’t think I will forget to do that again. Well the weather wasn’t too bad this morning. 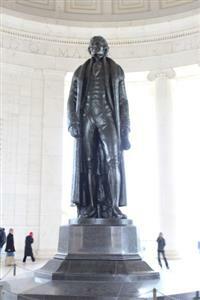 I decided to head into DC and go to the Jefferson Memorial. I was pretty sure there was plenty of parking nearby and figured I could asses weather I wanted to go any farther into the city by car. The parking wasn’t as close as it used to be, so it was a bit of a hike to the memorial. So I spent about an hour at the memorial taking pictures and just hanging out. 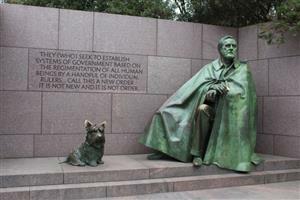 On my way back to the car I noticed the FDR Memorial wasn’t to far away, so I headed over there. This was the first time I’ve been to the FDR memorial, it was a lot bigger than I was expecting. It’s a granite path about as long as a football field that winds around a series of stonewalls with quotes from FDR, waterfalls, fountains and statues. It’s really well done and definitely something you should add to your list of things to check out in DC. Well it was starting to get a bit colder and I was tiered of walking around the streets of DC, so I decided to go to a huge museum and walk around inside. 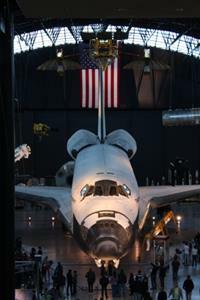 The Steven Udvar-Hazy Center is Part of the Smithsonian Air & Space Museum, Basically it’s where they put things that they cant fit in the main museum. The last time I was here wasn’t to long after they opened, at that time they were prepping the Shuttle Enterprise for display. Since then they have acquired the shuttle Discovery and moved the Enterprise to the Intrepid in NYC. For dinner I totally left my comfort zone, but that’s what it’s about, trying new things. So tonight’s choice was another DDD stop. La Caraquena is a Venezuelan restaurant. 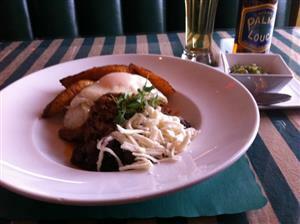 My entrée was Pabellon a Caballo, which is seasoned pulled beef served with white rice, black beans topped with white cheese and a sunny side up egg and sweet fried plantains on the side. They also brought a small dish of chopped jalapenos, I really tried to use them, but man they were hot. Fortunately I was able to wash it all down with a Palma Louca, which is a Brazilian beer. Much to my surprise, I loved the whole meal, with the possible exception of the jalapenos, but I really tried to like those. It's starting to snow. Maybe a change of plans, I think I;m going to head south tomorrow. It's been about 18 months since my last trip, but I'm back on the road again. This trip is designed to explore the middle Appalachian area around West Virginia, Kentucky and Tennessee, with a few other cities thrown in for some fun. Other than that the drive was uneventful. 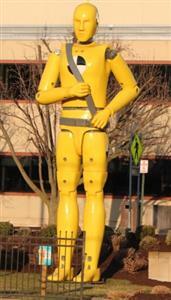 I was however a bit surprised to see a 30’ Crash test Dummy standing across the street from my hotel. He seems to be helping the DMV Promote the use of seatbelts. I don’t know if this is his permanent home or if he’s on tour. And then there’s dinner… The Stoney Creek Inn is the first of the DDD (Diners Drive Inns and Dives) restaurants on this trip. Obviously a seafood restaurant in this part of Maryland is known for it’s crab. Unfortunately local crab aren’t in season right now, but they did a fine job with the imported stuff they were serving tonight. I of course ordered the combo platter in order to have a taste of several items from their menu. The Fried Shrimp were a bit over cooked. The oysters were good, not great. 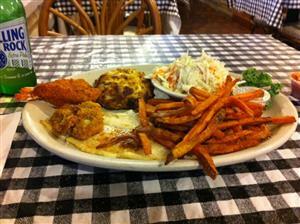 The broiled flounder was dry, The Crab Cake was fantastic, made with huge hunks of crab and cooked perfectly. They served the Sweet Potato Fries with a cinnamon and sugar mix to sprinkle on if you want. The fries were good, but the cinnamon sugar didn’t work for me, maybe it’s a Yankee thing, But I prefer the Maple syrup they serve at Hafners in Syracuse. Tomorrow I’m supposed to head to DC but they’re calling for snow tomorrow, and rain and snow around the rest of my trip. I’m kinda thinking of heading to Myrtle Beach for a day or so to warm up a little, very little. On my way back to Seattle I made a quick stop to see George, Washington. Why? Why not, how often do you get the chance to visit George, Washington. 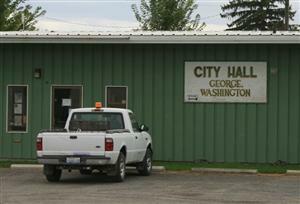 OK, George was pretty boring, but I did kill an hour and a half driving there and back. and there was some nice scenery along the way. 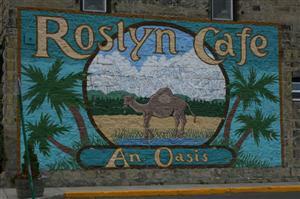 Then I stopped in Roslyn. The old Northern Exposure town of Cicely, Alaska. I was here 19 years ago while the show was still in production. There have been a few changes in the town since then, but not many. The storefronts for KBHR and Ruth-Anne's store are gone. The storefront that used to be Dr. Fleischman's office is now a gift shop, Marilyn's desk and chair are still in there. The Brick and the Roslyn Cafe are still open. But the Moose is long gone. I was told that Dave, the cook at the Brick, now lives in town and is trying to revive the show. Also next July at the Roslyn Moose Festival Rob Morrow and Janine Turner are scheduled to make an appearance. Last but not least, Diner at Bizzarro Cafe. Ever since my first night in Seattle all I can think about is the Clams with Linguine diner I had there. I have to say that was the best meal I've ever had. No other meal has ever left my mouth watering for it ten days later. But did I order it again, no. I decided I didn't want to chance tarnishing the memory of that meal, so I decided to try something new. Ducky Pillows; Homemade pasta stuffed with duck and white beans with a white wine and sage butter sauce. It was excellent, not as good as the Clams and Linguini, but still an excellent meal. Now i just have to find more reasons to go back to Seattle so I can try the rest of the menu at Bizzaro. So now I'm at the airport, my flight starts boarding in 30 minuets and I should be home by 11am on Friday. Then I can sleep the rest of the day. BTW: according to the odometer on the rental car I drove 3,137 Miles. This morning was going to start with a quick trip to the Old Idaho Penitentiary Museum followed by a long drive to southern Washington. When I arrived at the penitentiary I found that they were on winter hours, noon to 5pm. I had about 2 hours before they opened. I was about to leave when I noticed a small Mining Museum next door. So I went in to kill some time. When I signed in the woman working the museum asked where I was from. Come to find out, she was from Brewerton; her family built and operates the Fort Brewerton Blockhouse Museum. We ended up talking for close to an hour. Then I went over to the woman’s prison and looked around there, still I had 45 minutes to wait, and a long drive ahead of me. I got in my car to leave and drove a few blocks to a gas station. Filled the tank and got ready to hit the road. Fifteen more minuets till the pen opened. I drove back and took the quick tour. It was worth the wait. I got on the road about 1:30pm. Fortunately I would be crossing back into the Pacific Time zone, gaining an extra hour. My next stop was the granddaddy of all henges, The Sam Hill Stonehenge in Maryhill, WA. Is probably the first of all the "Clonehenges". But Sam didn't just build this to attract attention. While Sam was in England during WWI he saw the original Stonehenge and was told that it was used for human sacrifices. He remarked "humanity is still being sacrificed to the god of war." After returning home from the war, Sam wanted to pay tribute to the 13 men from the area that did not return home. He didn't want their sacrifice to go unnoticed. That thought reminded him of Stonehenge. 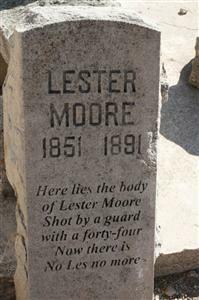 On the pillars within the circular structure are 13 bronze plaques with the names of those 13 men. Sam completed this memorial in 1929. This is considered to be the first memorial to WWI solders in the United States. 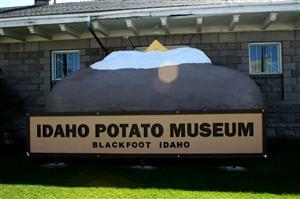 How could I go to Idaho and not go to the Idaho Potato Museum. The museum has lots of potato planting and harvesting equipment, as well as many facts about potatoes. Of course a large collection of potato mashers and Mr. Potato heads. My next stop was going to be a tour of the world’s first Nuclear power plant, but they were closed until next Summer. I decided not to wait. it seems that more nuclear reactors have been made in central Idaho than anywhere else in the world. I guess they need the power to bake all those potatoes. So I moved onto the next stop 10 Miles down the road. 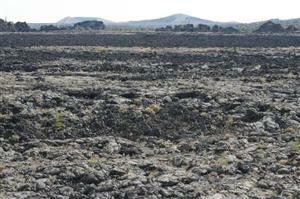 The Craters of the Moon National Monument. These lava beds were created between 2 and 15 thousand years ago and made it very difficult for the early settlers to pass through the area. Last stop, Twin Falls Idaho. 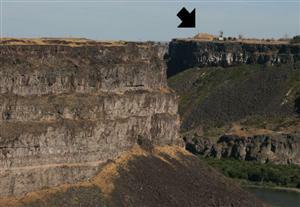 The Location of Evel Knievels Famed Snake River Canyon Jump. Because the actual Jump site is on private property, it isn't possible to go to the site, but the arrow in this pic shows the dirt ramp he used to launch the Skycycle. The trip is winding down. Only a few stops left tomorrow and Thursday. Then I'm on the redeye home Thursday night. I started the day at the Wendover Aviation Museum. This is a very small understated museum considering the important part this airfield played in bringing WWII to it's end. This Airfield was used both to train the crew of the Enola Gay as well as develop and test the necessary modifications to the B-29 and the "Little Boy" Atomic Bomb. There really isn't much to see here. The museum owns the original 5 buildings on the airfield, but only the operations building is used as the museum. They only have one airplane on display, a C-54 similar to the cargo plane used to transport parts of the bomb to the Enola Gay for her mission. The plane is in bad shape and needs a lot of work. 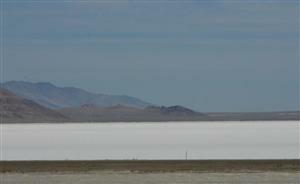 The Bonneville Salt Flats. Home of the Bonneville International Raceway. I drove to the race area and at first was lucky that a private event was scheduled for today, I had a good chance of seeing someone run their car rather than just see a big empty lake bed. Ten minuets after I got there they locked down the area to clear the track for a run. Five minuets later he took off, then I saw a puff of smoke, He blew the engine right off the line. Two minuets later we heard the bang. It was going to be at least an hour before anyone else was ready to make a run. I could have driven out to the pit area but I just wasn't comfortable driving a rented 2012 Escalade out on the Salt Flats. So on to my next stop. 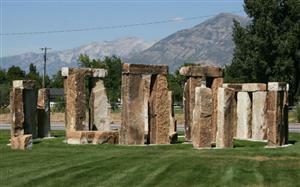 You know I love a good henge. The last place I would expect to find one is in the middle of the Mormon capital of the world. Of course the Stonehenge skilled nursing and rehabilitation center needed a lawn ornament, so why not. While I was driving north on I-15 to my next stop I saw the Hill Air force Base Aerospace Museum. I couldn't resist. I only had an hour and a quarter before they closed and literally lock the gates. So I had to move fast. I was able to find several planes in their collection that made this worth the stop. A B-17G, a B-29, a B-52G and a C-130B. It's OK to shoot the Public? Then back on the road. Time was running low. 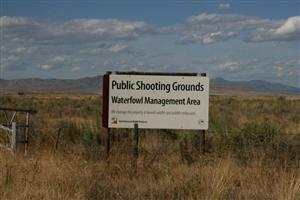 Maybe it's just me, but I don't recall seeing any public shooting grounds in NY. 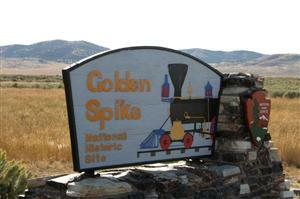 I finally made it to the Golden Spike Historic Site at 5:08pm. They close at 5:00. I'm staying in a hotel about 20 miles north of the site. Will I try again tomorrow? I don't know. That will take up most of my morning. I don't know if I can afford the time. From what I have read I'm not sure it is even worth it. The actual golden spike isn't here (it's at Stanford University). The two trains that met here aren’t here (they were sold for scrap) The trains here are imposters. This isn't actually the spot were the railroads met (that's in Colorado) this is just the spot were they held the ceremony. So maybe I saw all I needed to see. Maybe it's best to just keep heading north. 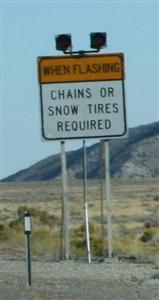 All I did today was drive across northern Nevada @80mph. Well I kept seeing signs that said 80, turns out I was on I-80, oops. After spending 5 days in this car I discovered today that it has a sunroof, not that I needed it before with all the overcast weather I've had. It will however come in handy for the rest of the trip. I ended the day at the edge of the Bonneville Salt Flats. Tomorrow I drive to the flats, Salt Lake City, and up towards Idaho, gona get me some taters.